I know that many of you have been waiting for this, so I am happy to be able to report that 23andMe is announcing several exciting new Ancestry-related features at the Southern California Genealogy Jamboree today in Burbank. All four of these new features will be in beta testing by customers this summer. The screen shots below are approximations and may not be representative of the appearance of the final product since they are still in development. 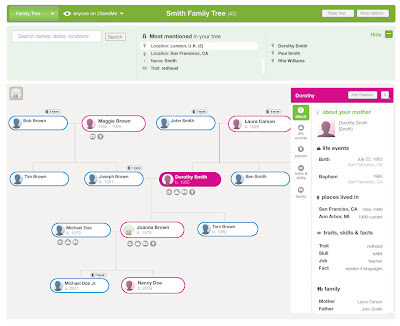 The names of the features also may change based on the feedback provided during beta, but these summaries should give you an idea of what to expect from the enhanced features for customers interested in their ancestry. Currently 23andMe's Ancestry Painting displays three major world regions (European, African and Asian). This feature is being updated to offer more detailed results based on approximately 20 world regions, drawn from both customer data and academic reference populations. I don't know a lot of details yet regarding the specific populations that will be identified, but there will be approximately six European sub-regions and the Native American is South and Central American. The image below shows the real data of Dr. Henry Louis Gates, Jr. host of "Finding Your Roots". Although this image does not necessarily reflect the detail that Ancestry Painting v2 will eventually offer, it does refine his European DNA to Northern and Southern European ancestry and, importantly, reveals that the portion of his DNA formerly described as Asian is actually Native American. The image below is simply a mock-up and not what the final version will look like. I know that many of you will be thrilled to hear that the new Ancestry Painting will include X-Chromosome Painting. I have seen some of the raw data behind this feature and it is pretty mind-blowing. I want to emphasize that the new Ancestry Painting will not be static and will be periodically updated and expanded as the database grows. This new feature will be a huge improvement for genealogists and, especially, those new to DNA testing. It will present the highlights from each individual's ancestry summarized on one page, encouraging engagement and increasing the ease with which customers can access the ancestry related labs and tools. Information presented on this page will include things like Ancestry Painting details, match totals, haplogroups, top Ancestry Finder countries and links to educational resources. This screen shot is only an example, so I wanted to point out to those of you who are detailed oriented that some of the numbers are not representative of a real account (i.e. - Tiffany shows over 4,000 matches). 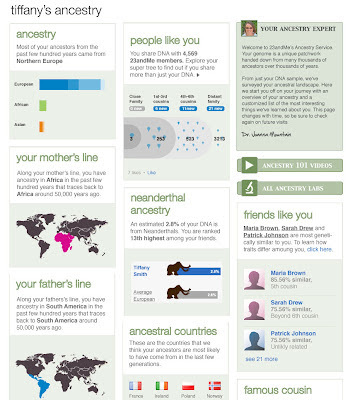 I expect that having all of this information available at a glance will help to increase participation in Ancestry-related features at 23andMe by capturing customers' attention and drawing them in to further explore their ancestry. This feature illustrates from where your 23andMe Relative Finder matches originate. Details that are added to profiles will be automatically included to show where your matches are living now and also known locations of ancestors. You can filter by the predicted cousin level and have the option to cluster matches or to see them individually. 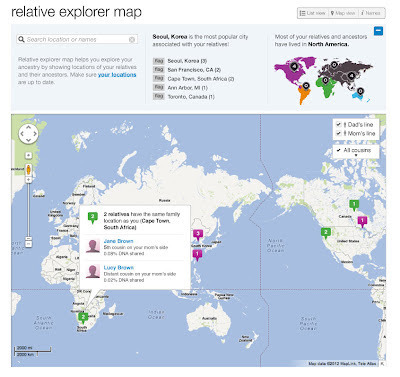 It summarizes your top locations and allows you to zero in on specific regions. I can already see some interesting clusters on my map that are worthy of investigation. It is very helpful to see all of this information summarized in one place because it encourages me to focus on one specific region at a time and delve deeper where indicated. This long-awaited and often-requested feature is finally being introduced. You can manually add details for individuals that include places, life events, traits, skills and fun facts, but don't worry, this feature will be GEDCOM upload enabled, so you genealogists will not have to retype your entire family tree. I expect that genealogists will have loads of feedback during beta for this feature. 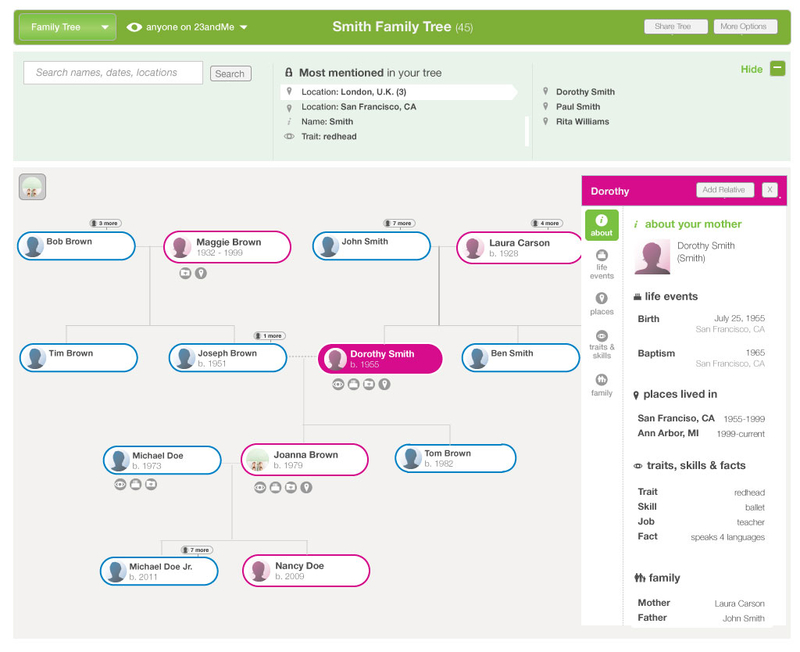 I think these new and improved features demonstrate that 23andMe is committed to their genealogy customers and are willing to invest the resources necessary to compete in this fast-growing industry. They have listened to the community's requests and are working toward a very competitive genetic genealogy product. Individuals interested in being beta testers for these new features can sign up at the 23andMe booth (#706/707) at Jamboree starting today. (I'm confident that there will be other opportunities to participate for those of you not attending.) For more information on the new features stop by the booth and/or attend the ISOGG meeting Saturday at 5:00 pm where I am participating on the panel with Mike Macpherson from 23andMe who can answer questions. I hope to see you there! Looks great - they are listening! This ought to put to rest that nasty rumor that 23andMe is not interested in genealogy. I'm excited about all of the positive movement since January as well as these features. I would also love to beta test as well, but if not, I can wait. Thanks for letting us know. As always thanks for giving us an early look at things to come. And can I say it again competition is good. It seems to be working on the soon to be big 3 in the Autosomal game. Each improvement by one company challenges the others to up the ante. How is Dr.Gates only 34% African? And how is he 60 southern European and only 10% Northern European? And how does he have so much more European than African? And if you go on Youtube and see Dr.Gates give speeches, he tells the audience,"None of Yall have have Native American ancestry,it's a myth. The Average slave did'nt even see a Native American." so this means that it's not a myth for him, huh? Does this mean that blacks who do 23andme will stop getting these stupid Asian percentages? And we know for sure that Dr.Gates'"Asian" is REAL Native American instead of miscalculated African. So 23andme can now predict Native American ancestry for African Americans? It' something how the percentage is the same. I don't know the details of the ancestry of Dr Gates but a 60/40 (European/other) split is not unusual for an African American. I would expect the percentage for NA vs Asian to be close as the Asian reference population is very similar to the NA reference population. If you study some YDNA and mtDNA migration maps you will understand why (the migration path is from Africa to America via Europe and Asia). I'd love to get in on this beta testing! Thanks for the update, CeCe! Ce Ce, Like the other commenters, I really appreciate your detailed updates on the plans for 23andme. The developments could prove to be very useful for genetic genealogy researchers. I recall statements made by Ancestry.com representatives at Rootstech stating that they would be able to pinpoint the villages of ancestors through their autosomal testing. 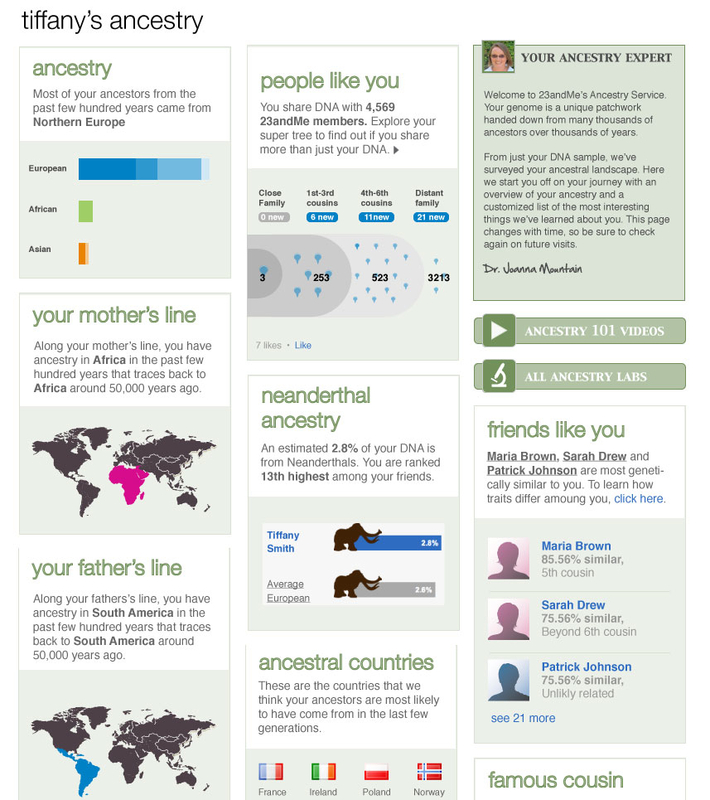 I would say that 23andme seems to be moving ahead of Ancestry.com in that respect. CeCe Wow wow wow, now that's a great leap forward especially for folks like us with very mixed European ancestry. Looking forward to what happens beyond Beta. I wonder when will we find out what those 20 population references are? Cannot help noticing that Africa in Tiffany Brown's maternal line includes a chunk of West Asia, the Arabian Peninsula. That may be intentional but doesn't comply with how Africa is defined. The screenshots are just mock-ups, so don't pay too much attention to the details. Send me an email describing specifically what you need and I will gladly send it to you. Any improvements welcome and appreciated. However, still nothing for the advanced user that combines detail provided in Ancestry Finder to all matches in Relative Finder - i.e. specific location and size of segment shares in comprehensive and easy to download format? Something similar to Family Finder's chromosome browser download, but for all matches, not just 5 at a time? Nobody interested in determining origin of shared segment since it might not originate with first common surname you might find in someone else's tree? Of course with Ancestry.com's new product not even offering any segment share or raw data details, no pressure to raise the bar. 23andMe is working as fast as they can to add new features. We all want what you describe above and are consistently encouraging them to go in that direction. Thanks for your comment.